Be the first tenants of a new strip mall ! 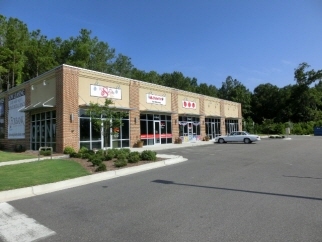 Strategically located at busy entrance to new development of Foxbank Plantation and Hwy 52. Flex space with total of 22 parking spaces. Unit A is 1500 SF with units B-E being 1200 SF. Unit A-B-C are leased leased. Units may be combined for more SF. End unit has two entrances, where a patio could possibly constructed. Two more building are proposed with build to suit. Proposed CVS is adjacent to property. Foxbank Plantation is a planned community hosting homes built by three builders. Homeowners and consumers in Foxbank Plantation would find this shopping center to be conveniently located. Perfect location for restaurant, dry cleaning, pet grooming facility, accounting office, nail salon, office, etc.